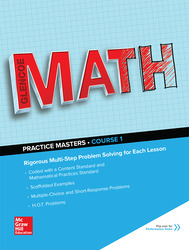 The Glencoe Math Common Core Practice Masters and Glencoe Math Common Core Performance Tasks Masters is set up as a flip book. It contains rigorous multi-step problem solving for each lesson and chapter. Includes scaffolded examples, multiple-choice and short response problems, H.O.T. problems, Depth of Knowledge and Scoring rubric with complete answers.